How to Calculate Overall Line Efficiency? In the garment manufacturing industry, we measure line efficiency on daily basis. Out of different KPI for efficiency measure, the overall line efficiency (simply Line Efficiency) is majorly measured by the garment factories. 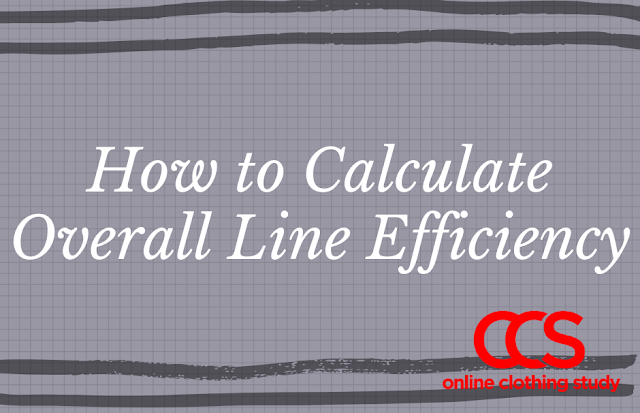 In this post, I will show you how to calculate overall line efficiency in a garment unit. Let me first explain what the overall line efficiency is. When operators are on the shop floor, sometimes they will work on the standard jobs, sometimes they will work on off-standard jobs and sometimes they may not be doing any job due to lost time (unavailability of work). In a day, each operator is given 8 standard hours for the work. The 8 hours shift time can be separated as standard work hours, off-standard work hours and lost-time hours. When the whole shift hours are used in the calculation, irrespective of how much time (hours) operators do an off-standard job and remain idle, it gives overall efficiency. When you calculate overall line efficiency, you don't need to deduct any hours. According to the hours they spend on these different type of activities their efficiency can be calculated as on-standard efficiency, off-standard efficiency. To calculate daily overall line efficiency, you need to measure how much hours (minutes) are produced by employees working on the line and how much time workers spent on the line for producing the output. The efficiency calculation will be done based on the line output data. Then use the below formula to calculate the line efficiency in percentage. Let' see what all data you need to calculate overall efficiency. Line output - number pieces produced by the line. It may be of one style or more than one style. In the first example, I am considering line makes only one style. You need to collect the above 4 information for the calculation. Example: Assuming that, Line-1 is making style ABC produces 410 pieces in 8 hours shift day. Standard minute of the style Z is 20 minutes and Total no. of manpower (operators + helpers) is 30. You can use the following template for calculating overall line efficiency. How to calculate overall line efficiency when a line produces more than one style in a day? In such case, calculate total minute produced combining two styles data. Total minutes attended will remain the same. Let's say line#1 makes two styles Style-1 and Style-2 of SAM 20 minutes and 25 minutes respectively. The production qty of Style-1 is 300 pieces a Style-2 is 200 pieces. 40 manpower work full shift of 8 hours. Hope you find this post helpful. Read more such calculations in Industrial Engineering label. Online Clothing Study: How to Calculate Overall Line Efficiency? Steps to calculate overall line efficiency of a stitching line. Formula for calculating line efficiency.